Lately I’ve been getting my cavalier on, both with a more-lazy-than-usual weekend and a couple of my latest posts featuring the rebuilding, possibly playoff-contending franchise out in Cleveland. It wasn’t my intention to continue discussing them through this week, but the young backcourt of Kyrie Irving and Dion Waiters felt worth looking at. 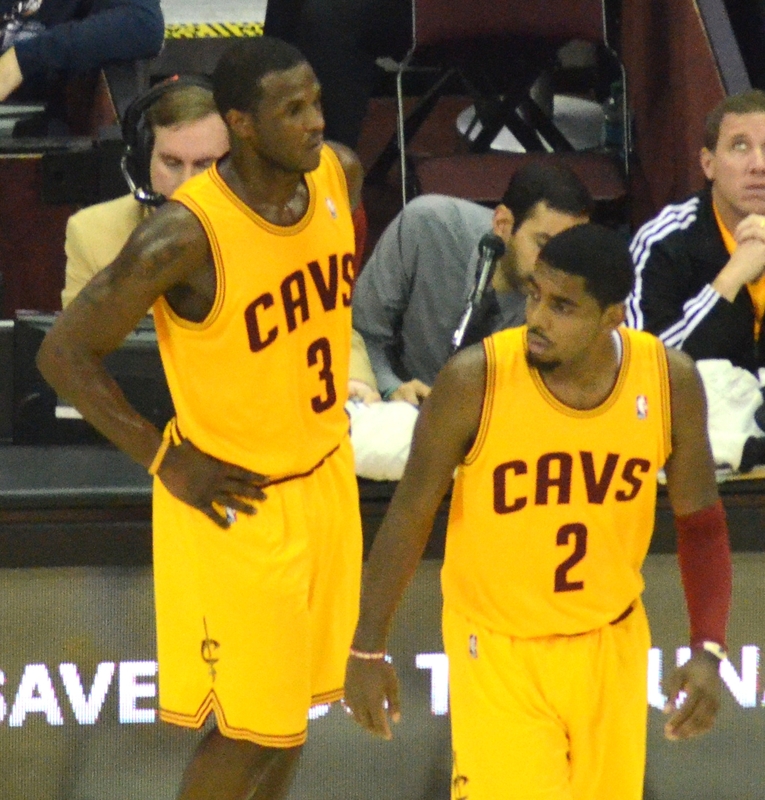 Irving and Waiters arrived in Cleveland through the 2011 and 2012 NBA Drafts, respectively. The former went first overall and the latter sparked a lot of discussion about going fourth, drafted when Cleveland also could’ve used a small forward or center for the future. Nevertheless, Cleveland locked up their backcourt. But the Cavaliers continue to struggle, 11 games under .500 as they approach the halfway point in the season. (They were 9-28 through 37 games a year ago.) Waiters is no longer in the starting lineup (not a terrible thing, to be fair), and he’s had a few words about his difficulties playing with both Irving and Tristan Thompson. He’s floated around in trade rumors since last summer, and it’d be no surprise if he’s playing for a new franchise by the end of his rookie contract. It all reminds me of a backcourt duo from over 15 years ago, back in the mid-90s when the Philadelphia 76ers retooled their backcourt with the third and first picks of the 1995 and ’96 drafts, respectively. Jeff Malone and Dana Barros were out and replaced with Jerry Stackhouse and Allen Iverson. Another reason I compared the two duos was because of their usage rates. Iverson and Stackhouse were the only starting backcourt in 1997 to each use up over 25 percent of their team’s possessions, according to Basketball-Reference. The same went for Waiters and Irving in 2013. Backcourt combos with similar high usage rates can succeed as long as they complement each other well, like Ray Allen and Sam Cassell for the 2001 Milwaukee Bucks and Tony Parker and Manu Ginobili for the 2010 Spurs. More often than not, however, guards with similar usage rates feature one starter and another as a spark off the bench, like how the Spurs have often used Ginobili. That wasn’t the case for the ’97 Sixers or the 2013 Cavaliers, though, and neither team won all that many games as a result. That’s not to say those four players were solely responsible for so many losses, but a team isn’t going far with two players taking over a combined 30 field goal attempts per game while recording effective field goal percentages (EFG%, when accounting for threes worth more than twos) below league-average, which usually ends up between 47.5 and 50 percent. In particular, Iverson and Stackhouse couldn’t spread the floor, shooting around 30 percent from the arc and playing an average of nearly 40 minutes per game. Bad times all around. Cleveland has since put Waiters in the role of a sixth man rather than pull the trigger on a trade. Philadelphia eventually scrapped their backcourt pairing and surrounded Iverson with players known more for their defense, starting when Stackhouse was sent to Detroit in December of ‘97 with Eric Montross and a 2nd round pick for Aaron McKie, Theo Ratliff, and a 2003 first-rounder. That first rounder, with the help of hindsight, was treated pretty unfairly. 25 months after trading Stackhouse, that pick would be sent to Houston for Mirsad Turkcan. (Turkcan didn’t do much at all in the NBA, but in fairness he ended up being a force of nature overseas. He was a nominee for the 2001-2010 Euroleague All-Decade team, but did not make the list.) In June of 2001, the first-round draft pick was then traded from Houston to Atlanta for Terrence Norris, then traded to Sacramento for Dan Dickau, and finally sent back to Detroit with Jon Barry for Mateen Cleaves. The draft pick ended up being Carlos Delfino, but treating a pick like that in the one of most loaded talent pools could’ve led to disastrous results. But trading Stackhouse deserves a ton of credit when the Sixers’ front office had top-10 draft picks each year from 1992 and 1998, yet only kept two of them – Iverson and Larry Hughes – by 1999, when Philadelphia finally made the playoffs. They too logged usage rates of over 25 percent each, though Hughes came off the bench instead of starting. He was traded the following season for Toni Kukoc. This all actually makes it a little more interesting that, despite the results from the Stackhouse-Iverson combo, Denver made the trade in 2007 to pair Iverson with Carmelo Anthony. Denver had a better supporting cast than Philadelphia in the mid-90s, and the Nuggets played 10 points better/100 possessions when Iverson was on the court in 2008 (according to Basketball-Reference), but it’s hard to expect two mediocre perimeter defenders and outside shooters like themselves to go deep in a loaded Western Conference. In Cleveland, Irving remains relatively safe from trade rumors while Waiters, like Stackhouse, has been thrown around in plenty. The Cavaliers still have plenty of trade assets left over even after acquiring Luol Deng, so it wouldn’t be all that surprising if Waiters is eventually moved before his next contract. The value of rookie deals in today’s NBA is so different from when Stackhouse and Iverson entered the league, though. Both trading and keeping Waiters feel like gambles, but at least Cleveland still has time to decide which decision is better for their long-term future.